Lady’s Mantle is an undemanding perennial charmer that’s beautiful and easy to grow. It has four- to six-inch wide leaves that look like pleated fans with shallow scalloped lobes and serrated edges. The lightly-haired velvety soft leaves have the delightful habit of retaining dew and rain drops like jewels, which stay in place until dried by the warmth of the day. Plant this perennial in dappled sunlight or part shade with evenly moist soil.Hardy in zones 4-7, it needs deeper shade and more frequent watering in the hotter regions, but is not fussy about soil type, or soil pH, and has no insect or disease problems. The plants grow into spreading mounds that are about a foot wide and tall. 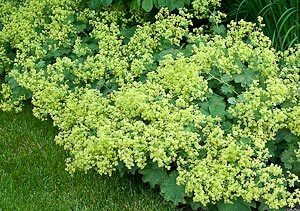 You can use Lady’s Mantle as an effective edging plant along borders and paths. It also creates a ground cover carpet under leggy plants such as roses and shrubs or trees. The softly rounded form complements and combines well with taller, upright plants such as Siberian irises, foxgloves and speedwells, but is equally at home with more spready plants such as hostas, ferns and astilbes. In late spring, airy sprays of small chartreuse flowers extend 12 inches above the leaves and make excellent long-lasting cut flowers. Use them as attractive fillers in bouquets. If very happy in its site, this plant may self-seed; to prevent this, just remove the flower heads as they fade. Many species have been described but only two or three are easy to find in catalogs or garden centers. Alchemilla mollis (sometimes sold as A. vulgaris) is the easiest one to find. Its only shortcoming is a tendency to flop or look a bit ratty after flowering when grown in full sun, but cutting back the old foliage will quickly produce a flush of bright new leaves. The cultivar ‘Thriller’ tends to hold its shape better then the species and seldom needs to be cut back. A. erythropoda resembles a miniature version of A. mollis and works well in rock gardens or in containers. 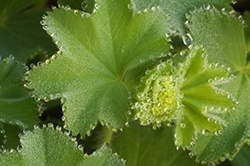 You can’t go wrong with Alchemilla in a flower garden: it’s a captivating plant that provides season-long interest with its subtle beauty and outstanding foliage. © 2019 flower-gardening-made-easy.com - All rights reserved.